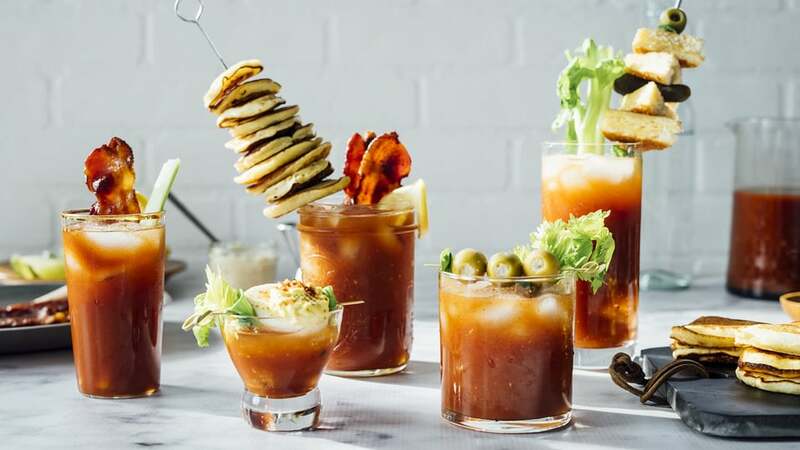 A bloody mary is the ultimate brunch cocktail: savory, spicy, and fortifying, especially after a night of indulgence. The classic version of the drink is garnished with lemon and lime wedges, as the citrus provides a little brightness to counter the rich salinity of tomato juice. But, over the past few years, bars and restaurants have gotten wildly creative with fun, over-the-top bloody mary garnishes that diners seem to love. Grilled cheese and tomato soup are a winning combo, and the same principle applies to tomato-based cocktails. 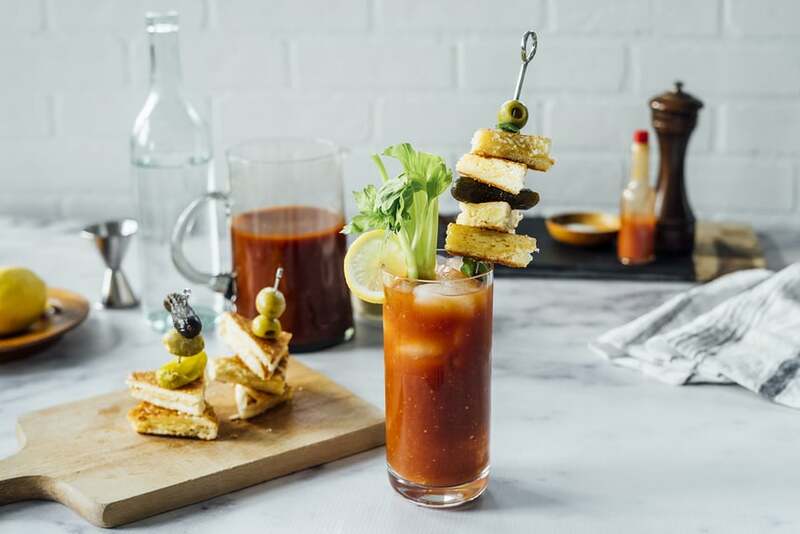 Pick your favorite grilled cheese recipe, make a few sandwiches and then cut them into small pieces to hang on the edge of your bloody mary glass. 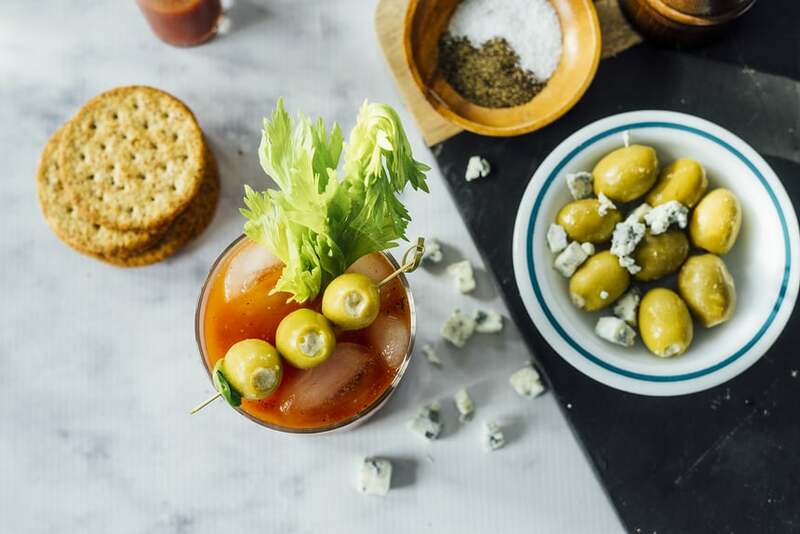 The tangy bite of blue cheese and the smooth, saltiness of olives are delicious with bloody marys. Visit the olive bar at your favorite market and stock up on stuffed olives. Thread a few onto a cocktail skewer and balance the skewer over the top of the cocktail. Why not include a snack with your bloody mary? 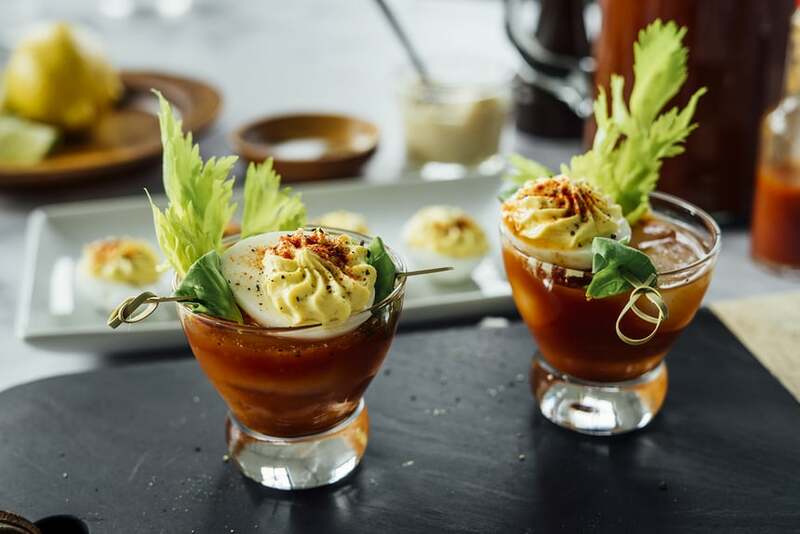 Hard boil a few eggs and whip up a quick deviled egg recipe. Thread each half-egg onto a cocktail skewer, sliding on a few dill pickles or capers, as well, if you have them on hand. Balance the skewer atop the cocktail and sprinkle a pinch of smoked paprika on the egg. You might be more accustomed to seeing bacon at brunch tucked into a egg sandwich, or cozied up beside a stack of waffles. But bacon makes an excellent bloody mary garnish, as well! 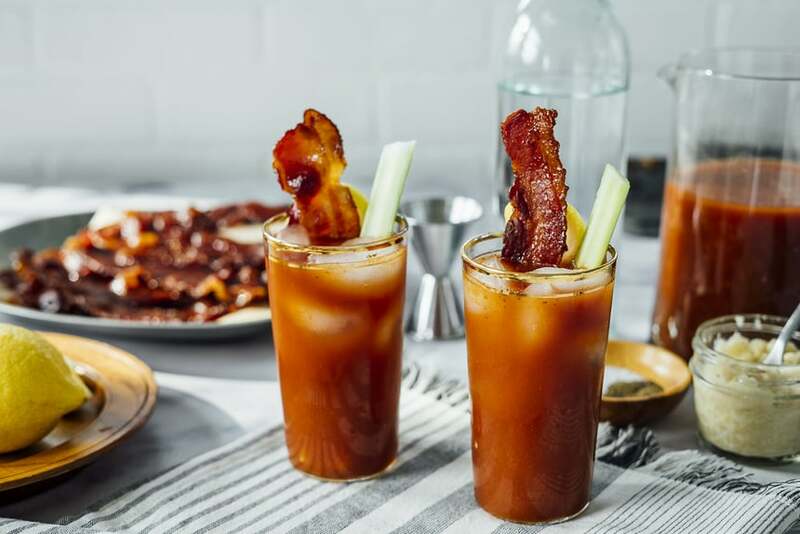 Candied bacon is even better, with a touch of sweetness to balance out all of the saltiness and spiciness of the drink. Simply combine a bit of maple syrup, a pinch of brown sugar and a few dashes of your favorite hot sauce in a bowl to make a glaze for the bacon. Brush the glaze on both sides of the bacon strips, and bake at 350° for 20 to 25 minutes. Allow the glaze to cool, and then stand one or two strips inside the prepared bloody mary. Put a smile on everyone’s face with a miniature stack of pancakes perched on top of their drinks. Prepare a classic buttermilk pancake batter, or mix it up with whole grains or something unexpected, like decadent chocolate pancakes. Make the pancakes silver-dollar-sized, then thread a small stack onto a cocktail skewer and sprinkle them with powdered sugar. To avoid soggy pancakes, set the skewer in the glass so that the pancakes aren’t touching the liquid.